Misato: A traditional Japanese breakfast begins with rice, miso, and sake.Shinji: Not all Japanese breakfasts, just Misato's. It's kind of weird, after having reviewed the later five volumes of this series, to go back and take a look at disc two. After all, by the end, I found the series to have confounded all my expectations�by the end, it was equal parts philosophical debate, existential argument, and, most of all, a deeply depressing portrait of shattered psyches. Funny, then, that the episodes here, towards the beginning of the series, are so completely different. The complex plot is already developing, of course, and character traits and personalities are more or less established, but the tone is vastly different. Here, there's much more humor, much more hope. It's not as dark as the later stuff, which is good, I suppose, but truth be told, a few of these episodes feel like filler.I won't recap the premise of the show (for that, check out some of the past reviews), but simply start with this volume, which includes episodes 5-8 of the 26-part series.Episode 5: Rei, Beyond Her HeartThis episode's chief purpose is to reveal some of the history of the heretofore mysterious Rei Ayanami, the pilot of Eva Unit 00. 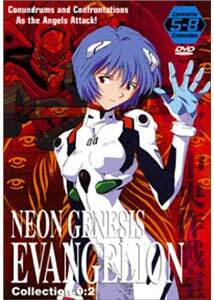 Through flashback, clues are given as to her past relationship with Shinji's father; there's also a rare show of emotion when she engages in a tense conversation with Shinji. As Rei is tested in her Eva, the next Angel attacks, forcing Shinji to once again defend Tokyo 3. This is a pretty engaging episode, simply because Rei is such a fascinating character. The cliffhanger ending, some mecha action, and some cute interplay between Shinji and Misato helps as well.Episode 6: Showdown in Tokyo 3Continuing where the last episode left off, Shinji is rescued but injured, forcing Rei to fend off the Angel's attack. This is another show focused mostly on Rei, and it's another good one. Mostly action this time around, there are some tense scenes of the preparation to defeat the Angel, but character moments continue to pop up here and there, particularly at the very end (which, incidentally, was the moment I knew I had to finishing buying the series, way back in the days of VHS).Episode 7: The Human CreationI'll say it up front: this is probably the worst episode in the series, simply because it is totally unnecessary. It seems NERV isn't the only organization with a plan to stop the Angels, as another group develops the Jet Alone, a computer-controlled mecha without a pilot. During the test run, it goes berserk (it's unclear if NERV was involved in sabotage), and Misato takes it upon herself to perform a dangerous mission to stop the computer brain at its source. Nothing really happens, and things are unchanged at the end. There aren't even any particularly good character moments. The action scenes are well done, but ultimately frivolous.Episode 8: Asuka Strikes! I'll say it up front (again): this is probably the funniest episode of the series (which is a lot better, don't you think?). Shinji travels to the middle of the ocean to meet the pilot of Unit 02, the fiery German Asuka. Asuka and Shinji have a hilarious relationship�right off the bat, she criticizes and makes fun of him, and, in typical Shinji style, he barely reacts. When an Angel attacks, the two crowd into the same entry plug to defeat the invader with Unit 02. A great introduction of a great character, and some very amusing dialogue, make this one one of the standouts of the show thus far. Image Transfer Review: Though it doesn't look terrible, the image here has some problems. Colors look a bit dull and hazy, which detracts from the overall appeal of the picture. The look is a bit on the soft side, and at times, digital grain is evident. In addition, in a few instances, the picture seems to jitter in the frame, which is distracting. On the plus side, black level is fine, and only minor artifacting and aliasing is evident. Audio Transfer Review: The main soundstage on this mix isn't as wide as I would've liked, but other than that, quality is fine, but unimpressive. Dialogue always sounds clear, though a little harsh, especially in the English dub (though some of that may be the performances). Music fills out the mix, but is never enveloping. There are some panning effects during the action scenes, but no involvement from the surrounds. Pretty basic, but representative of the material as originally conceived. Extras Review: Extras are pretty limited. All you get are some spoiler-heavy character bios and the usual ADV trailer gallery. This time, the familiar clips include: Martian Successor Nadesico, Bubblegum Crisis 2040, Gasaraki, Sin, Lost Universe, and the ADV on DVD Promo. Neon Genesis Evangelion Collection 0:2 presents the series at its most enjoyable. The storyline certainly isn't as complex as it will become later, and character development doesn't play as large a role, but the quirky humor and frequent action scenes more than make up for the discrepancy. A must for fans of the series (who probably already own this volume, truth be told).